A natural cranberry and blueberry extract with marshmallow and vitamin C to help support the healthy functioning of the urinary tract. For use in cats and dogs prone to struvite crystals and bladder infections. This product helps to balance urinary tract pH, to dissolve struvite (Magnesium-Ammonium-Phosphate) crystals, which may develop in urine if it is too alkaline. Cranberries and blueberries contain a substance called Hippuric Acid that has been shown in recent studies to have antibiotic activity, which helps to prevent bacteria such as E. coli from adhering to the bladder wall, thus inhibiting the development of infections. Blueberries contain powerful antioxidants, which cleanse the body of harmful free radicals and promote good health. They are also thought to be helpful for bone and joint problems associated with free radical damage. Did you know that we also use blueberries and cranberries in our dry dog and cat foods? Urinary tract blockages and infections are serious conditions and immediate veterinary attention should be sought if your pet shows signs of frequent urination, discomfort, or straining. 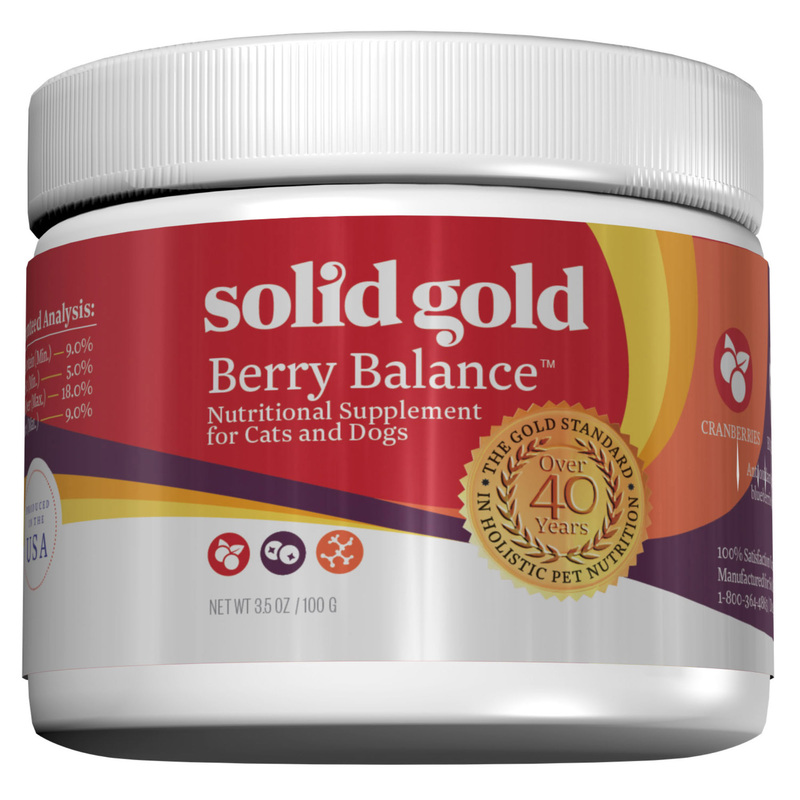 Berry-Balance can be used to support the urinary tract and help reduce the risk of further infection or struvite formation. This product should not be used for calcium-oxalate crystals, nor should it be used in conjunction with a medical or commercial “acidifying” diet. Increased stress can predispose pets (especially cats) to urinary tract disorders because fear can lead to reluctance to make trips to the yard or litter box and drinking water. Increased fluid intake is recommended for animals prone to urinary tract problems. Canned foods provide more moisture than dry kibble, and plenty of fresh drinking water should be available at all times. Rice Flour | Cranberry Extract | Ascorbic Acid | Blueberry Extract | Marshmallow | Silica Gel | Natural Flavoring |Available in 3.5 oz. containers.